28 July 2015, Kuala Lumpur: The Malayan tiger is now officially listed as Critically Endangered in the IUCN Red List of Threatened Species, the world’s most comprehensive source of information on wild animals and plants and the level of threat they face. 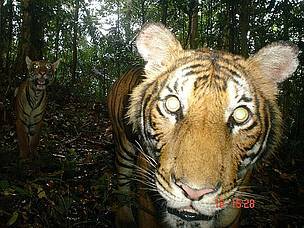 Recognised as a new sub-species just over a decade ago, these tigers of Peninsular Malaysia were once estimated to number around 500. However as of June 23, they have been placed in a category of wildlife that face highest risk becoming extinct in the wild. The Malayan tiger qualifies for this category because the best available evidence indicates that the number of mature individuals is likely less than 250 animals and has declined by more than 25% in one generation (seven years). It also meets a second criteria - there are no pockets of forest in Malaysia with an estimated population of 50 or more mature tigers. The decline was first brought to national attention by Perhilitan and the Malaysian Conservation Alliance for Tigers (MYCAT) last September when studies across three major tiger landscapes in Peninsular Malaysia between 2010 and 2013 suggested that there may only be 250-340 wild tigers left. “This acknowledgement of our research is sadly, a tacit recognition that our tigers face a bleak future,” said MYCAT General Manager, Dr. Kae Kawanishi. With the exception of the announcement of a national survey to produce a more accurate population estimate of the Malayan tiger, little has changed since last September. “We appreciate that the country has been absorbed with a host of economic and political issues in recent months, but we cannot carry on with this level of inaction and disinterest,” said TRAFFIC Southeast Asia Programme Manager, Kanitha Krishnasamy. “The concerted efforts of all parties are crucial, from governmental bodies to NGOs to members of the public. All of us need to acknowledge the seriousness of this issue and act fast as the tiger’s extinction is not an option for Malaysia,” said WWF-Malaysia Executive Director/CEO Dato’ Dr. Dionysius Sharma. MYCAT reiterates the call for a high-level national task force to plan and manage the recovery of wild tigers. We stress the urgency for new tiger patrol units to strengthen protection against poachers. An honest and thorough review of the National Tiger Conservation Action Plan and the determined implementation of the Central Forest Spine Master Plan must take place soon. It is the least we can do for one of our own. MYCAT also calls on the Malaysian public to voice their concern and show their support for their wild tigers. To say no to the use of tigers as medicine, exotic meat or pets; to report wildlife crime to the Wildlife Crime Hotline (019-356 4194), and to let their elected representatives know that this is a problem they want to see action on.